Kansas City Chiefs vs Denver Broncos: "Left Handed? Give Up League"
The Kansas City Chiefs are 4-0 on the strength of a double digit 4th quarter comeback win lead by Patrick Mahomes in Denver. I stated last night, that this was a massive game for the Chiefs and that for them to win, it would be historic; and it was. The Chiefs won their 4th straight game in the mile high city, and 6th straight overall match up with the Denver Broncos. This marks the longest win streak Kansas City has had in Denver since 1965-1969 and the longest overall against the Broncos since 1970-1973. The Chiefs have also now won 18 of their past 20 divisional match ups, and lead the AFC West by 2 games with 2 road wins in their pocket. We are just 1/4 of the way through the 2018 NFL season, but the Kansas City Chiefs have a total stranglehold on this division. The pundits had a lot of critiques and questions about this Chiefs team going into this one. How would they handle adversity? How would the young QB handle the spotlight? Could the defense make a play when it needed to? On and on. The Chiefs went out and answered every question with a resounding YES last night. En route to the victory, Kansas City also snapped Denver’s league best 65 game win streak when leading by 10 or more in the 4th quarter. The win wasn’t pretty, it wasn’t flashy, but at the end of the day it was exactly what the Chiefs needed to put their doubters to rest. Let’s start with the defense. The Chiefs defense has been much maligned all season, and rightfully so. They came in ranking near the bottom in all statistical categories, and to be honest, in this game they didn’t play all that well. They gave up 7.2 yards per carry to Denver on the ground, and tackled like a junior high team for much of the game. 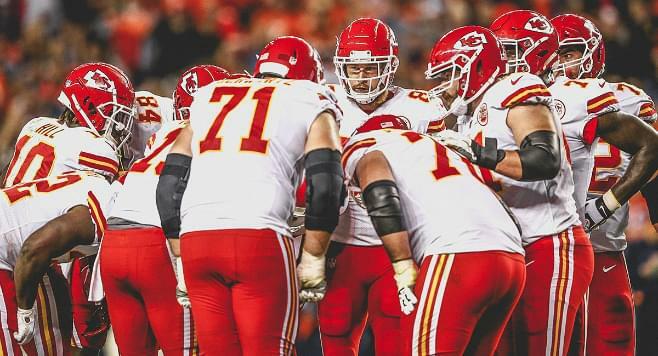 However, when the fourth quarter came around, the Chiefs defense stepped up like it hadn’t all season and held Denver scoreless to enable the Chiefs to make the comeback. They were able to get after Case Keenum, sacking the Broncos QB 4 times, and hitting him an additional 9 times over the course of the night. Yes, on the final drive, Demaryius Thomas did break open in the soft part of the zone and Keenum missed the throw; but overall the Chiefs defense really stepped up at the most crucial parts of the game to give the offense the opportunities it needed to pull out the W.
Kansas City is now 4-0. There’s a ton to be excited about, and honestly, I’m having a really hard time keeping perspective on things because we haven’t seen THIS type of thing before by the Chiefs. Just sit back and enjoy the ride Chiefs Kingdom, that’s all I can say. The opening stretch of the season continues this Sunday as the Chiefs return to 1 Arrowhead Drive to take on the 3-1 Jacksonville Jaguars in an early season battle for AFC conference supremacy. Pregame will start Sunday at 11. Kickoff at Noon and it can be heard on Topeka’s Rock Leader, V100!